Or should that be “Home-proof your child”? When children begin to wriggle along in their nappies it’s time to look for head-height disasters. Almost half of all kids’ accidents take place at home – around 900,000 were treated last year in hospital. Take home safety seriously, and you could save yourself a trip to A&E. Use our whistle-stop tour to childproof your home in minutes. Falling over is the most common cause of child accidents (CAPT). This is no real surprise: young children are developing their coordination and physical aptitude, and falling forwards, backwards and sideways is a normal part of every day. But you can help prevent a serious fall by making a quick assessment of your home. Look for trailing wires, sticking-out furniture, loose carpet edges, sharp edges, gaps in banisters, and windows that open widely. Pin down those wires, tuck away furniture, nail down loose carpet and rugs, fit furniture corner protectors, and fit safety gates and safety catches. The first stop in the kitchen is the cleaning cupboard. It’s a good idea to fit this with a lock: even those “child-proof” bottles can be fiddled open by a dextrous five-year-old. When your children are tall enough, it is a good idea to fit locks or catches on drawers too – particularly those containing knives. The next issue to think about is burns and scalds. Even hot drinks are risky: because your child’s skin is much thinner than yours, a splash of tea could burn within 15 seconds. Make sure the kettle and its wire are kept way back on the surface and out of reach. Similarly, put saucepans with their handles facing away from the edge of the cooker. If your bathroom cabinet is within reach of curious children, fit it with a lock- perfumes, oils and medicines are all very dangerous to young children, and the pretty bottles are sure to catch their eyes. Drowning is a real danger for young children: it takes as little as 2” of water for a child to drown. When bathing your child, supervise throughout – don’t leave the room, even for a moment. After you’ve finished, empty the bath straight away to make sure children won’t come back in soon after. If you have a large mirror in your bathroom, you can add stickers (to show it’s solid) or transparent safety film to make sure it doesn’t cause any problems. Finally, lay a slip-proof mat beside the bath, and mop up any puddles as soon as possible to avoid falls. Child-Proof the Play RoomThe playroom or living room – wherever your child lives and plays most – is a key accident site! Unfortunately, because the carpet is usually covered in toys and building bricks, it is the place your child is most likely to fall. Make sure your children tidy away their toys after playing – boring but safe. Get rid of small toy pieces, plastic bags and packaging. 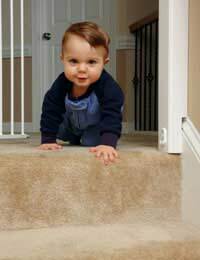 You can also fit safety gates to doorways to keep children from wandering up stairs. Like the playroom, the bedroom can become a real disaster area, so try to get your children into the tidying habit as early as you can. Don’t change babies on a high surface, if you can avoid it; the floor is the best place, as babies are likely to wriggle and fall. If you have bunk beds, don’t allow children younger than 6 to sleep or play on the top bunk. Now for the Garden…Now your home safety tour is finished, read our guide on childproofing the garden too!